Superb value mailers made from recycled and reinforced corrugated cardboard, with added strength provided by extended corners. 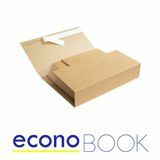 These brown econobook boxes are the cheapest book packaging we stock, yet still provide the standard of protection you demand. Once packed, the boxes can be easily sealed at home with tape or glue. Our econobook boxes are perfect for posting books, CDs & DVDs - in fact any occasion when you need to be totally confident that your product will reach its destination undamaged! Order from stock now for immediate dispatch and very rapid delivery. These cleverly designed economy book boxes are easy to assemble and fold down to completely enclose and protect your contents, making sure they always finish their journey in the same condition they started. With a series of built-in creases, they can easily be folded to suit the height of the books you are posting from 10 - 60mm.